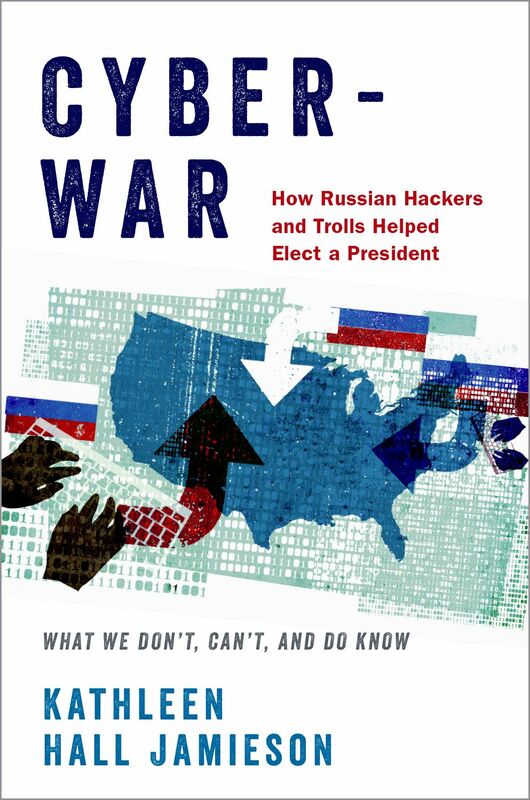 In the new book “Cyberwar: How Russian Hackers and Trolls Helped Elect a President – What We Don’t, Can’t, and Do Know,” from Oxford University Press, Kathleen Hall Jamieson concludes it is likely that Russian help was crucial to Trump’s win. Jamieson, director of the Annenberg Public Policy Center of the University of Pennsylvania and professor of communication at Penn’s Annenberg School for Communication, explains in “Cyberwar” the multiple ways in which the Russian interference could have altered the election outcome. Drawing on work in which she and her colleagues isolated significant communication effects in the 2000 and 2008 presidential campaigns, Jamieson marshals the troll posts, unique polling data, analyses of how the press used the hacked content, and a synthesis of a half century of media effects research to argue that, although not certain, it is likely that the Russians helped elect the 45th president of the United States. Jamieson argues that Russian trolls used social media to aid Trump while hackers tied to a Russian agency gained unauthorized access to stored Democratic emails, data, and memoranda and distributed them through WikiLeaks, shifting the media agenda. Read more about “Cyberwar” at www.cyberwar2016book.com and at Oxford University Press.